This article is about the baseball player. For the Canadian football player, see Casey McGahee. Casey Michael McGehee (born October 12, 1982) is an American professional baseball corner infielder for the Yomiuri Giants of Nippon Professional Baseball (NPB). He previously played in NPB for the Tohoku Rakuten Golden Eagles, and has also played in Major League Baseball (MLB) for the Chicago Cubs, Milwaukee Brewers, Pittsburgh Pirates, New York Yankees, Miami Marlins, San Francisco Giants, and Detroit Tigers. Born and raised in Santa Cruz, California, McGehee graduated from Soquel High School in Soquel, California, where he competed in baseball and basketball. In baseball, McGehee was a four-year letter winner and was named County Player of the Year for his junior and senior seasons. However, he finished 2nd in the league in batting average to Harbor High star, Mike Urbani, brother of former St. Louis Cardinals pitcher Tom Urbani. His senior season he hit .489 with 10 home runs and did not strikeout once during the season. McGehee holds the SCCAL all-time hits record and was an AAU All-American for his junior and senior seasons. McGehee then attended California State University Fresno. At Fresno, McGehee played left field his freshman season before transitioning to third base as a sophomore. During his freshman season, McGehee was a Baseball America honorable mention freshman All-American. During his sophomore season, McGehee was co-MVP of the team, and after another excellent junior season, McGehee decided to leave Fresno to play in the MLB. McGehee was drafted by the Chicago Cubs in the tenth round of the 2003 Major League Baseball Draft out of Fresno State. McGehee was a September call-up for the Cubs in 2008, making his major league debut on September 2. He went 0 for 1 in his first game. Following the season, he was claimed off of waivers by the Milwaukee Brewers, and added to their 40-man roster. On March 31, 2009, it was announced that he would be a reserve infielder for the Brewers in 2009. When Ryan Braun got injured, third baseman Bill Hall played at Braun's position in left field, while McGehee started at third base. When Rickie Weeks got injured, he made his first start at second base. With Bill Hall struggling at the plate, and Mat Gamel struggling on defense, he saw a lot of time at third base. He hit his first home run on June 14, 2009 off of Mark Buehrle of the Chicago White Sox; it was one of his two RBIs in the game. On June 29, 2009, he hit his first career grand slam off of New York Mets pitcher Brian Stokes, which came after he committed an error that led to two unearned runs. On July 4, McGehee had career highs of four hits and five RBIs against the Chicago Cubs. Although he came up short on the NL Rookie of the Year balloting for 2009, his solid season cemented him a starting job at third base for the Brewers in 2010. McGehee was voted the Brewers' Most Valuable Player. He edged out second baseman Rickie Weeks and outfielder Corey Hart for the award. McGehee batted .285 with 23 home runs and a team-leading 104 RBIs in 157 games. 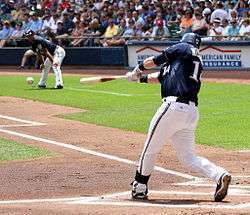 On August 12, McGehee sets a team record with nine consecutive hits in going 4 for 4 in the Brewers' 8-4 win over the Arizona Diamondbacks. McGehee hit a home run, a double, and two singles, driving in four and scoring three runs to lead Milwaukee. He grounded out in his first at-bat the next day to end his streak. In 2011, he batted .223 with 13 home runs, three of which came in the same game on August 3. All three were off of St. Louis Cardinals pitcher Edwin Jackson. He led all NL third basemen in errors, with 20. 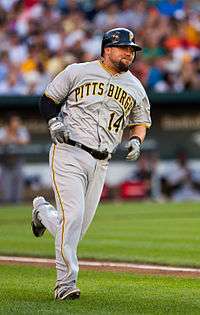 On December 12, 2011, hours after the Brewers agreed to a contract with Aramis Ramírez, McGehee was traded to the Pittsburgh Pirates for José Veras. On July 31, 2012, McGehee was traded to the New York Yankees for RHP Chad Qualls. The Yankees traded for 1B/3B McGehee after injuries to Alex Rodriguez and Mark Teixeira. On August 28, 2012, McGehee was optioned to Class-A Charleston to make room on the 25-man roster for a recently acquired Steve Pearce. He was recalled when rosters expanded in September. He signed a $1.5 million contract to play in Japan for the Tohoku Rakuten Golden Eagles on December 21, 2012. McGehee led the Golden Eagles to their 1st Japan Series title. Also leading the way were Japan Series MVP Manabu Mima, current Yankees star Masahiro Tanaka, and fellow former MLB outfielder Andruw Jones. In 144 games, mostly at third base, McGehee hit .292 with 28 HR and 93 RBI. McGehee's period in Japan paid off, and on December 18, 2013, McGehee signed a one-year, $1.1 million deal with the Miami Marlins to start at third base. McGehee hit his first Marlins home run on May 10, despite hitting .309 with 23 RBI in 36 games before. It was in Miami that Casey earned his nickname "Hits McGehee". It is a play on a joke from the movie Anchorman. In 159 games of 2014, McGehee grounded into an MLB-leading 31 double plays while batting .289 with 4 home runs and 76 RBI, winning the Major League Baseball Comeback Player of the Year Award for the National League. On December 19, 2014, McGehee was traded to the San Francisco Giants in exchange for minor league pitchers Kendry Flores and Luis Castillo. He was designated for assignment on May 24. On May 26, McGehee accepted an assignment to the Giants AAA team, the Sacramento River Cats, but was promoted up a couple weeks later after batting .357 (15-for-42) with two homers and three doubles. He was designated for assignment again on June 30. On July 10, 2015, the Miami Marlins signed McGehee to a one-year contract. On February 23, 2016, the Detroit Tigers signed McGehee to a minor league contract. On March 28, 2016, McGehee was released by the Tigers. On March 30, the Tigers re-signed McGehee to a minor league contract. On June 18, 2016, the Tigers purchased McGehee's contract from the Toledo Mud Hens. In early August 2016, McGehee was called up to the major leagues by the Tigers following an injury to Nick Castellanos. On December 3, 2016, McGehee signed with a one-year contract with the Yomiuri Giants that includes a club option for the 2018 season. McGehee is married to wife, Sarah, and has two children, Mackail (Mack) and Cooper Reese. Mack has Cerebral palsy. They met in Jackson, Tennessee where Sarah lived and Casey played for the minor league West Tennessee Diamond Jaxx. ↑ "Archived copy". Archived from the original on November 19, 2012. Retrieved 2015-08-09. ↑ "Chicago Cubs add six players to active roster". MLB.com. September 1, 2008. Retrieved November 4, 2009. ↑ "Weeks out for '09 with wrist tear". ESPN.com. Associated Press. May 19, 2009. Retrieved November 4, 2009. 1 2 "Casey McGehee Statistics and History". Baseball-Reference.com. Retrieved October 3, 2011. ↑ Haudricourt, Tom (December 12, 2011). "Brewers trade McGehee for Veras". Milwaukee Journal Sentinel. ↑ Dierkes, Tim (July 31, 2012). "Pirates, Yankees Swap McGehee, Qualls". ↑ Axisa, Mike. "Yankees option Casey McGehee to Low-A Charleston". River Avenue Blues. ↑ Associated Press (December 20, 2014). "Giants trade for Casey McGehee". ESPN.com. Retrieved December 20, 2014. ↑ "Giants 3B McGehee designated for assignment". ESPN.com. Associated Press. May 24, 2015. Retrieved May 25, 2015. ↑ Schulman, Henry (May 25, 2015). "Giants Splash: The full story on Casey McGehee being cut from roster". San Francisco Chronicle. Retrieved May 25, 2015. ↑ Baggarly, Andrew (26 May 2015). "UPDATED: Casey McGehee accepts minor league assignment (with a twist), will report to Triple-A Sacramento". Mercury News. Retrieved 10 June 2015. ↑ Gitlin, Marty (5 June 2015). "Report: Giants recall 3B Casey McGehee from Triple-A". CBS Sports. Retrieved 10 June 2015. ↑ "Casey McGehee designated for assignment by Giants". ESPN.com. Associated Press. June 30, 2015. Retrieved July 1, 2015. ↑ Beck, Jason (February 23, 2016). "Tigers, McGehee agree on Minors deal". MLB.com. Retrieved February 23, 2016. ↑ Beck, Jason (March 28, 2016). "Tigers release Parnell, option Rondon to Minors". MLB.com. Retrieved March 28, 2016. ↑ Beck, Jason (March 30, 2016). "Tigers re-sign Parnell, McGehee to Minors deals". MLB.com. Retrieved March 30, 2016. ↑ McCosky, Chris (June 18, 2016). "Tigers call up infielder Casey McGehee from Toledo". The Detroit News. Retrieved June 18, 2016. ↑ Beck, Jason (August 7, 2016). "Castellanos breaks bone in left hand on HBP". MLB.com. Retrieved August 7, 2016. ↑ Byrne, Connor (December 3, 2016). "Casey McGehee To Sign With Japan's Yomiuri Giants". mlbtraderumors.com. Retrieved December 3, 2016. ↑ Shearer, Kati (March 28, 2011). "Behind home plate through the eyes of Mrs. McGehee". Journal Sentinel. Milwaukee, Wisconsin. Retrieved May 25, 2015. ↑ Navarro, Manny (April 8, 2014). "Casey McGehee happy for new chance with Miami Marlins". Miami Herald. Wikimedia Commons has media related to Casey McGehee.